Growing up on the coast, my parents used to take my sister and I off to the seaside every summer holiday, at least once a week while the weather was sunny. Packed into our obligatory cooler bag would be several rounds of exceptional egg and cress sandwiches, along with all the other essentials. 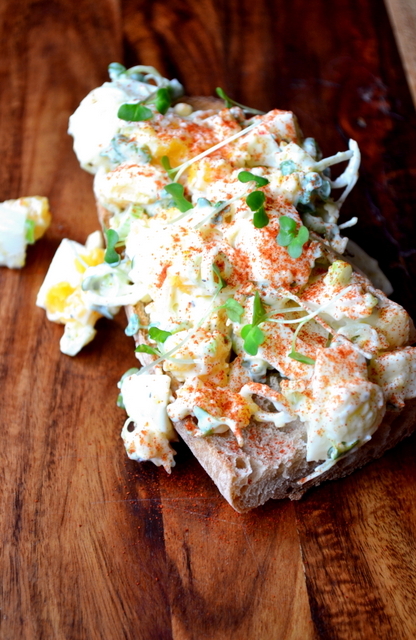 Simple though they are, egg and cress sandwiches have easily worked their way into the heart of Britain (and perhaps further afield with the American egg salad). Perfect, I think, for a teatime treat on the beach, or indeed anywhere. My one quibble with the egg and cress sandwiches of old is the practice of mushing the ingredients to within an inch of their lives. Cutting the eggs by hand into larger chunks of 12-16 pieces not only promotes an interesting texture, it improves the flavour and overall aesthetics of the sandwich. The addition of a sprinkling of paprika is also an important one. Though applied only conservatively, it adds an extra dimension of flavour and a sweet kick that complements the egg perfectly. People often talk only in terms of hard-boiled and soft-boiled. There is, however, a middle ground that, while no good for dunking, works very well when chopping eggs. What you end up with is a warm, comforting yolk, with a luxurious texture, far nicer than the dry centre of a hard-boiled egg. Trust me, boil your egg for 5 minutes; it may seems strange, but you’ll thank me once you have. Immerse your eggs in cold water and bring to the boil. Once boiling, cook your eggs for exactly 5 minutes. Once cooked transfer them to a bowl of cold water and leave to cool. Crack your eggs all over and peel carefully. Rinse and cut into 12-16 pieces each. 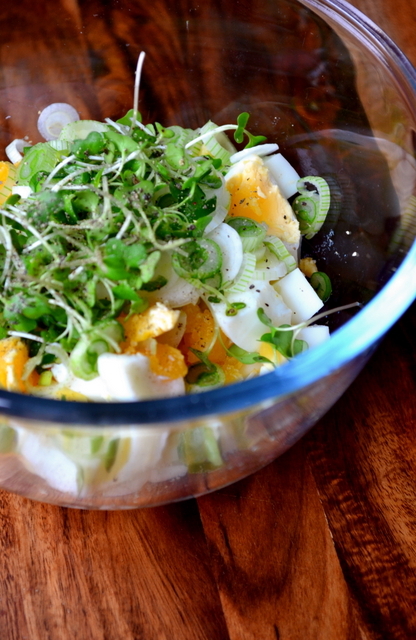 Place the slices of egg in a large mixing bowl and combine with the spring onion, half the cress, mayonnaise and salt. 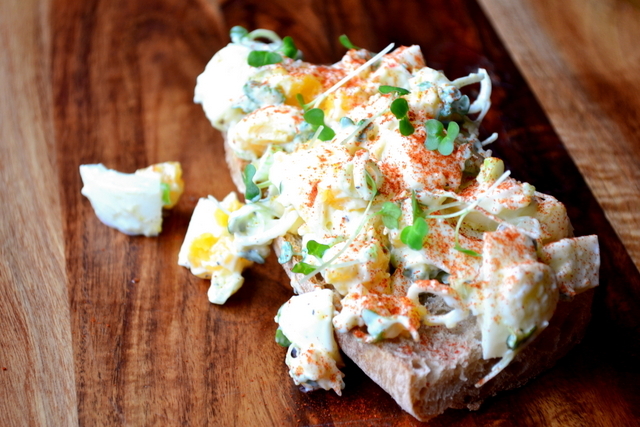 Spoon the eggy mixture on to the slices of lightly toasted bread and sprinkle with paprika. Garnish with the remaining cress and serve. Cost: Though sometimes expensive in supermarkets, good-quality free-range eggs can be bought very cheaply at your local grocers. Half a dozen eggs should set you back no more than £1.20. As such, these delicious egg and cress open sandwiches should set you back around £1.20 (bearing in mind you use 4 eggs, rather than 6!). I completely agree – softer-than-hard boiled yolks, and big chunky pieces. Looks delicious! So true! I don’t mind the yolks mashed up, but I hate it when the whites are. 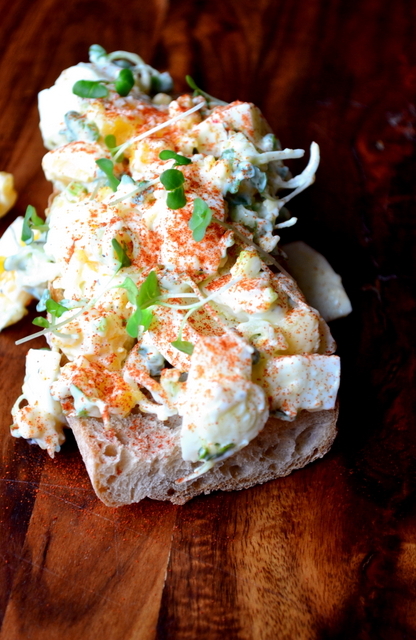 Recently, I added some smoked paprika to an egg salad (seldom any shortage of eggs here) and thought I was so clever. Then I Googled and saw that tons of people had beat me to it. I will have to try it with watercress for sure. See, I like getting a mouthful of delicious yolk! 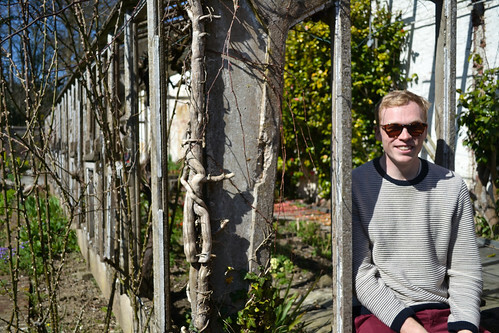 Even my Gran used to add paprika – but this was really special stuff and so, so delicious. Cress sounds like a great addition to egg salad. I’ll have to give it a try! OH it is – my mum always used to add it. Ahh egg and cress sandwiches – a quintessential sandwich offering we are sorely missing here in Australia! It’s a shame, because done well – especially like this – they are such a pleasure! I will have to count the pieces after I cut my egg, but I’m squinting at the picture above and looks about like my size. Delightful!! Hello! And welcome to the Large Chunk Camp – enjoy your stay. Large chunks are the best – trust me, these chunks are right. Certainly does look good! Yum.